In the context of education around sustainability, the 3 Rs of waste management are recycling, reuse and reduction. Let’s explore these three themes a little more. 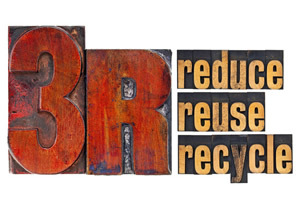 Recycling refers to disposing of waste in ways that allow useful materials to be extracted and reused. For instance, household waste comprises biodegradable matter like food as well as material like plastic, metal, glass and paper, which may not be easily bio-degradable. Waste food, vegetable peel and other such matter can be composted. This compost can then be used for organic farming, thereby reducing the dependence on chemical fertilisers. Non-biodegradable material can also be recycled. For example, recycled plastic (and sometimes glass) is used in making roads. The addition of these materials increases the life of the roads. Even electronic devices and electrical appliances can be recycled by separating them into component materials like plastic and various metals. Often, expensive metals like gold and platinum are used in high-end electronics. Recycling such metals is as good as mining virgin ore and extracting metals from it and can help manage the gap between demand and supply. Reuse has more to do with extending the useful life of a product. Paper that’s been used only on one side can easily be used to jot down shopping lists or “to do” lists. Children’s clothes, toys and books are also excellent candidates for reuse. DVDs, CDs, calculators, watches and even old cameras, laptops and computers are ideal too. To someone who does not have a watch and does not have the money to buy a new one, even an old, out-of-fashion watch will be valuable. There may be many such things in your home that you no longer need, but are in good condition. Rather than throwing them away as “waste”, consider donating such items to charities so that others can benefit. Besides reducing the load on landfills, the knowledge that you have made a difference to someone’s life is emotionally satisfying. We may never know, but imagine if an under-privileged student used your child’s books to study and eventually becomes a Nobel laureate or a best-selling writer! If you don’t fancy charity, try and sell what you don’t need on online forums or market places. Someone may be looking for just the thing you are seeking to get rid of. You reduce clutter in your home, while also making some money. Now that’s what is called a “win-win” situation. Reduction, the 3rd “R”, involves making fundamental changes to our lifestyles. Can we, for instance, use a mobile phone for three years instead of buying a new one every year? It’s not about affordability in the financial sense; but it is about environmental profligacy and its disastrous consequences for all humankind. For businesses, the concept of reduction involves the use of technology to innovate manufacturing processes that consume less energy, less materials or replace conventional materials with lower-cost, more abundantly available material. Another facet of “reduction” is the use of “smart automation” in business processes and in offices so that energy, water and other resources are conserved. The essence of this all is to “waste not, want not”.